8.5x11, lxxiii + 236 pp. The Dominican friar Girolamo Savonarola, a fiery preacher who dominated Florence from 1492 until he was burned at the stake for heresy in 1498, promoted the singing of sacred Italian laude as part of religious and social reform. 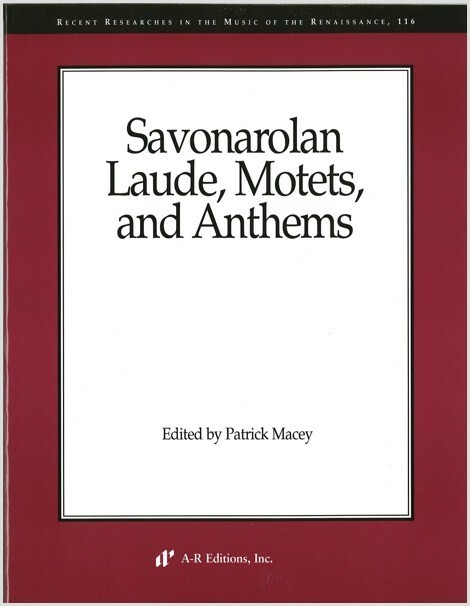 The present volume makes available laude for Savonarolan celebrations of carnival, as well as settings for laude written by Savonarola himself, and laude written in veneration of the friar. In contrast to the simple musical style of the laude is the elaborate music of the Latin motet. Savonarola scorned such elite music, yet many prominent composers from the sixteenth century created musical settings of his motto "Ecce quam bonum" (Ps. 132:1), and of his meditations on Psalms 30 and 50. The edition includes motets by Richafort, Verdelot, Willaert, Clemens non Papa, and Claude Le Jeune. An Elizabethan, William Hunnis, translated the meditation on Psalm 50 into English, and verse anthems were composed by Mundy and Ravenscroft.